UPDATE: this article was originally written to work with Arduino 1.01 and the KK2.0. The KK2 is now up to 2.1 it has an ATMega624 and a slightly different I2C gyro (demo program is not updated for this yet). I have updated the document to work with the newer KK2 however I recommend that you still use the older version of Arduino. Originally designed for multi rotors, the KK2 Multicontroller makes for a very cheap Arduino compatible board with a little bit of hacking. For $30 you get an ATMega324 MCU, a 128x64 graphical LCD, 4 buttons, 14 GPIO pins, 3 axis gyroscope and 3 axis accelerometer. The kk2.1 has an or ATMega644 which has twice the amount of Flash, Ram and EEProm storage on board. Great for any motion based project that requires a simple user interface. Video demonstrating the Arduino test code. Detailed explanation of the Arduino test code. UPDATE: Robert and Erikas had pointed out that I made a few errors in this tutorial. (Thanks guys) Fortunately they figured it out. I have since made some changes so hopefully no more mistakes here. You will also need a USBasp programmer. The Arduino IDE codebase is still changing and currently is up to version 1.5. This is mainly to support the newer Due and Leonardo boards. This tutorial was tested using Arduino 1.01 which can be downloaded from the Arduino download page. Seeing as your are messing with the IDE it is probably better to keep Arduino 1.01 as a separate copy of the program just for working with the KK2. I cannot guarantee that this tutorial will work with other versions of Arduino, feel free to try but I see no advantage as yet. Step 1 Install Arduino 1.01 and the USBasp drivers if needed. Arduino 1.01 can be downloaded from the Arduino download page. I suggest renaming the App to Arduino1.01.app if you want to run it along side a newer arduino version. Drivers for the UBSasp programmer are not needed for OSX or Linux. Windows follow the instructions in my previous article. To find the boards.txt file. On OSX control click on Arduino.app then show package contents. For windows the boards.txt file is under hardware/arduino in the arduino program directory. Open it with wordpad as it handles the unix carriage returns better than notepad. Add the following section to the top of the boards.txt file and save it. Tip: windows users use wordpad, notepad will not handle the carriage returns properly. Step 2. Add the KK2 variant. Download the pins_arduino.h file from the bottom of this article. 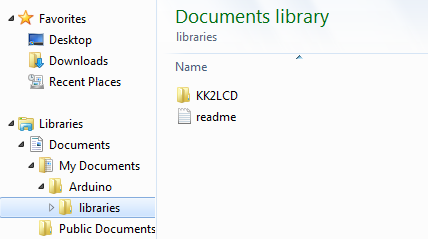 Then create a new folder kk2 and place the pins_arduino.h file inside. The code in pins_arduino.h is where all the magic happens. Basically it maps the pins from the ATMega324 to the more familiar Arduino format. If you are running the KK2.1 you can skip this step. This step is done because the version of AVRDude that is bundled with Arduino has a bug in its config file, don't worry this is easy to fix. and open avrdude.conf with a text editor. Windows use a code editor, or failing that wordpad. Notepad cannot handle the Unix carriage returns in this file. Search for ATMega324 to find this part of the document. We need to change the signature from 0x1e 0x95 0x08 to 0x1e 0x95 0x11. Step 4. Add the LCD library. Download the KK2LCD library from the bottom of this article. Unzip it. As long as you have opened Arduino at least once you should have an Arduino directory in your documents folder. 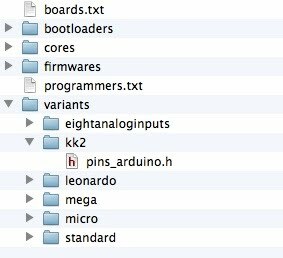 If there is no libraries folder in the Arduino directory create it. Then put the KK2LCD folder inside that. Alternatively you can unzip the library in the library folder. Step 5. Connect your programmer and KK2. Step 6. Upload the example code to your KK2. Make sure all the edited documents are saved and closed. Quit Arduino and then open it again. If all went well you should have the example program running on your KK2. Feel free to copy and modify my example code below (it is also included in the KK2LCD library). Remember to always upload using the Upload Using Programmer option as the regular upload button will not work. //Arduino on the KK2 test code by Marc Griffith is licensed under a Creative Commons Attribution 3.0 Unported License. const byte IN2 = 1; //PD2 (PCINT26/RXD1/INT0) interrupts good for CCPM decoding. //motor outputs can also be digital inputs. these also have PCINT16 to 23 Arduino interrupts not tested. const byte RED_LED = 13; //PB3 (PCINT11/OC0A/AIN1) //same as arduino! //most of the hardware pwm is on the LCD, LED pins so dont bother. There is PWM on the buttons. digitalWrite(BUT1, HIGH); //enable internal pullup. // every time I write debounce code it comes out different. Complicated but I like the feel of it. //we could put a beep in here too. // needs fixing, causes memory leaks !! solution. edit avrdude.conf. This is ugly but it works. dont program it with it on your lap! Graphics!. A delve into the openAero code and some that KaptienKuk posted has helped get this working. windows, no installation needed, just run it. MacOSX, macports, wine, and run with wine. Important, Arduino code use external analog reference. otherwise when you try to do an analog read it will short out and reset, lucky no damage. This took a while to figure out but the details are buried in the datasheet. None of the output pins have PWM, so KaptienKuk does it all in software. The PWM pins seem to be wasted on the buttons and LCD interface. There are 8 PWM pins available, not sure why KK did not use them all for the outputs. Must be a good reason. UPDATE. Correction, there are 6 PWM pins available (thanks to Ciskje from Italy). I can see now the reason. Other comms methods are available which means opportunities for expansion. Perhaps KK has a GPS, Magnetometer or Baro add on in mind? Serial connections exposed, RX0, TX1 and RX1. TX0 is used on the LCD interface. But Serial1 can be used to talk to a computer via an FTDI chip for example. I2C is available on the output headers. SPI can be used as a master but the Slave Select pin is on one of the buttons.